Maury County’s first-year state Rep. Scott Cepicky, R-Columbia, has introduced a bill that would bring a harsher penalty to those caught with a small amount of marijuana inside a Tennessee school zone. Under the Student Protection and Zone Equity Act, currently listed as HB0238, any type of drug-related crime within a drug-fee zone, 1,000 feet from a school, park , library or daycare, would be considered a Class E felony. The most lenient felony class in the state, a Class E felony charge is punishable by one to six years in prison, as well as a fine up to $3,000, according to state codes. The bill would put and end to a legal loophole used by drug dealers in Maury County and across the state, Cepicky said. After passing on second consideration Monday, the bill will be reviewed by the Senate Judiciary Committee and the Criminal Justice Subcommittee in the State House. Sen. Joey Hensley, R-Hohenwald, filed the act’s coequal, SB0328, in the state Senate. Cepicky said he has the support of Maury County Sheriff Bucky Rowland and 22nd District Attorney General Brent Cooper. Cooper said the charge would not apply to the purchaser, only the person selling or with intent to sell the drug. Cepicky said the bill also tries to create “equity in its application” across the sate, reintroducing bits of legislation attempted in the past. The proposed bill also outlines that any county with a population greater than 300,000 residents would shrink the size of the drug-free zone from 1,000 feet to 500 feet. “For example, if you are 1,000 feet from Mt. Pleasant Elementary School, you are in the middle of a corn field, but at 1,000 feet from Hume Fogg High School in downtown Nashville, you are down by the Bridgestone Arena. That is not a school zone,” Cepicky said. The change would affect Davidson, Shelby, Knox, and Hamilton counties, with Rutherford County expected to soon follow. During the previous General Assembly, a similar bill which initially had bipartisan support following an investigation which found that the currently law led to harsh sentences that disproportionately affecting African-Americans in metropolitan areas where large swaths of drug-free zones cover the urban landscape. 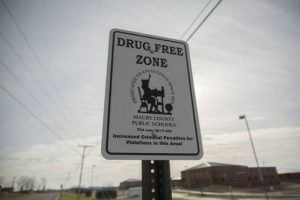 The libertarian monthly print magazine Reason revealed that more than 27 percent of Nashville and more than 38 percent of Memphis is covered by drug-free zones. Because the change was expected to create $4 million in savings for the state, the bill’s main supporters former Rep. Tilman Goins, R-Morristown, and Sen. John Stevens, R-Huntingdon, proposed the savings be used to pay for additional positions with District Attorney officers and public defenders. However, the proposal died on the floor after the prospective piece of legislation was amended by a Senate finance committee to excluded the funding for the additional positions. The change brought opposition to the bill from the District Attorney’s conference, according a report from the Nashville Scene. Cepicky said he drafted the new bill after meeting with Maury County’s drug task force, which reached out to him on the topic. The bill currently has 15 Republican sponsors, excluding Cepicky. Those supporters include Rep. Sam Whitson, R-Franklin; Rep. Clay Doggett, R-Pulaski; and Rep. John Ragan, R-Oak Ridge.